If you've ever heard the sound of a banjo, then you might very well quiver at the thought of two being played together. At the same time. Alex & BB redefine this vision, with their exquisite combo of 5-string banjo and Irish tenor banjo. These two young banjo virtuosos, Alex Borwick and Catherine “BB” Bowness, provide fresh insight into an instrument often associated with country folk, duels, and the Beverley Hillbillies. Audiences will have a chance to hear their unique musical interpretations during their 2011 nationwide tour. 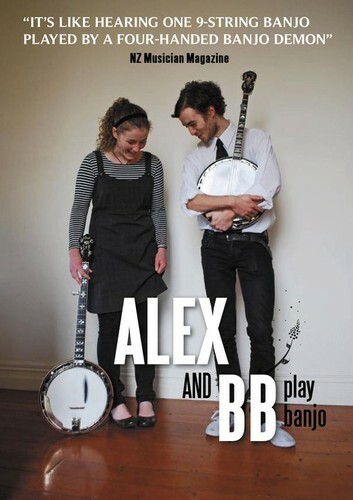 In November 2010, Alex & BB released the EP, 'Play Banjo', a small offering of their musical ventures so far. The EP received strong critical acclaim, NZ Musician Magazine said: “They work together so well it’s almost like hearing one 9-string banjo played by a four-handed banjo demon”. Both Alex and BB continue to hone their craft and study their instrument to learn how to take it to new, undefined boundaries with regular trips overseas to study from other banjo virtuosos. Together, they work on gathering material old and new to combine into new pieces for their instruments, including a few songs, which they aim to present and play in a way that is different to what they have heard before and in turn, offering a new perspective on what the banjo can do. In concert they reveal an intellectually stimulating array of performance pieces. “It's hard not to pay tribute to all our influences. They draw together in our playing and create a journey through a variety of different styles and soundscapes all of which the banjo portrays differently,” explains Alex. “Our original compositions are an extension of this, fusing together these different genres and creating new pieces for the banjo which we hope show it in a new, graceful light.” All this, presented with the duo's vibrant energy and emphasis on enjoying what they do, is a sight worth seeing.